Lovingly, as we know it today, was founded not by an individual idea, but with a collaborative conversation, a joint effort, a trusting agreement—we agreed to never stop working to strengthen relationships through meaningful giving. Seated around a small dining table in Montreal in 2008, we first sat with Lou La Venia from Rosette Florist. 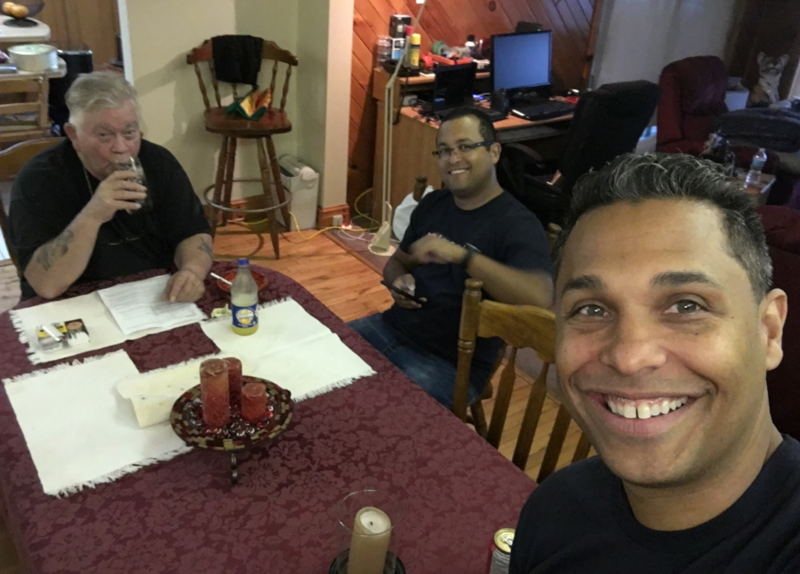 Joe, Ken, and Lou at Lou’s home in Montreal, 2018. Lou, like countless other florists, was the victim of an industry determined to turn profits at the expense of the people behind it all; the artists. Ken and I knew there had to be a better way—a way to improve the lives of florists… a way to change the industry for the better. Lovingly, as we know it today, was founded not by an individual idea, but with a collaborative conversation, a joint effort, a trusting agreement—we agreed to never stop working to strengthen relationships through meaningful giving. And at the heart of it, helping you (the local florist that makes it all happen) succeed means everything. After talking with Lou, we embarked on a journey to create an online flower buying experience designed to make it easier for customers to shop local and to help florists compete and win against Order Gatherers. With a clearcut and honest approach that local florists deserve, Lovingly’s hard-working websites put money back in the pockets of hard-working local florists—helping partners generate over $250 million in florist retail sales, saving businesses from bankruptcy, enabling business owners to expand their businesses and put their children through college, and to finally retire happily. Now, in 2019, as Lovingly enters its second decade, we’re taking our partnerships and relationships with the gift-giving community a daring step forward. We’re entering a new era for customers, for recipients, and for you. Through innovation and industry analysis, we’ve continued to route back to three core principles. First, the florist is an artist—each is a visionary designer. Second, the card message is magic—each tells a story. Third, gifting someone flowers is an emotional cycle—each person shares the love. Our partnerships are based on mutual respect. Lovingly has built thousands of high-performing websites for florists like you, so you can get back to doing what you love; being creative. And that’s why we’re thrilled to announce the tool that will move the floral industry forward… the Lovingly Marketplace. We’re always looking for ways to optimize what we offer and improve your life. We asked for feedback from people sending flowers (surveys, polls, requesting reviews), and we’ve studied the feedback. The overwhelming responses reflected emotion. Senders wanted to make their recipients feel loved, appreciated, welcomed, respected. Flowers are a tool for expression, not the sender’s purpose. We then looked at how people buy flowers when they’re guided by an expert (like you) instead of browsing through thousands of options online. We saw that the flowers themselves carry meaning. They carry intention. They carry history. They carry memories. The story behind, “Why are you sending flowers?” had been lost through the lifeless process of buying them. Florists had become a gear in an assembly line. They had become an afterthought. We knew there had to be a solution, and we believe strongly that we’ve found one. We saw that the flowers themselves carry meaning. They carry intention. They carry history. They carry memories. A guided gifting experience that makes it easy to send a one-of-a-kind, beautifully designed floral arrangement, with a meaningful sentiment, to a friend, a colleague, or a loved one—ensuring they’re happy with their gift and delighted with you. We’re proud to introduce Lovingly Marketplace. What started as a friendly conversation in Montreal between friends, has led to a continuing promise to strengthen relationships by building products that embrace your creativity. Your flowers save relationships. Your flowers welcome new life. Your flowers console widows. Your flowers say, “I’m sorry.” Your flowers say, “I miss you.” Your flowers say, “I love you.” And each day, your flowers change the world. Together, let’s make today your day.